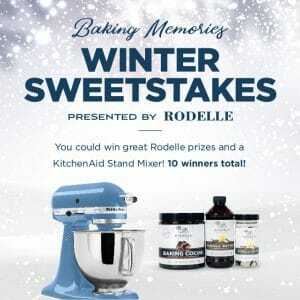 Baking Memories Sweetstakes – Winners! Last month, we celebrated the close of our Baking Memories Sweetstakes. The Sweetstakes was the biggest contest Rodelle hosted in 2018 and we had an amazing level of participation! It was challenging to pick the winners from a long list of great entries! We’re excited to share the winners with you, but first, a big thank you to every single one of you who participated, entered, shared, liked and followed along during the contest! Our team loved your Facebook posts, Instagram and Pinterest follows and all the Tweets that we saw!! We especially loved seeing everything you made with your friends and family on our Instagram page with the hashtag #bakingmemories! Talk about some talented bakers out there! Congratulations to all of our winners! We can’t wait to see what you use your ingredients and KitchenAid prizes to make! And, if you didn’t win this round, we’ve got an exciting contest coming your later in 2019! Stay tuned and happy baking!